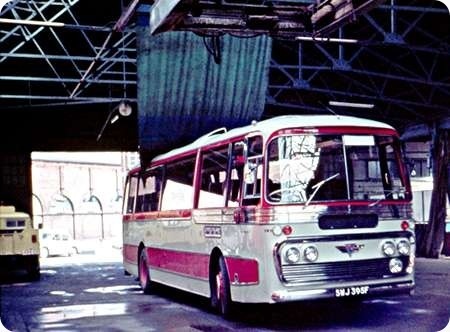 Definitely not taken on a tour, this is PMT Stoke No1 Garage underneath the Essex bus washing machine on 19th April 1970. PMT was going through a reliability crisis and amongst other vehicles (see Birmingham 2252 elsewhere on this site) hired in some coaches from Sheffield United Tours in their very elegant red/grey livery which well suited the lines of the Panorama body. The ex Forces Humber 4×4 recovery truck known to everyone as ‘Daffodil’ is just visible on the left of the picture. This was a bit light for towing buses and tended to be pushed around when doing so. A number of minor firsts here for SUT. First 6U3ZRs (AH691) as opposed to 2U3RAs (AH590). First illuminated name panels – which arguably cheapened the image. Change from blue interior (which was only for a year anyway) to autumn gold. 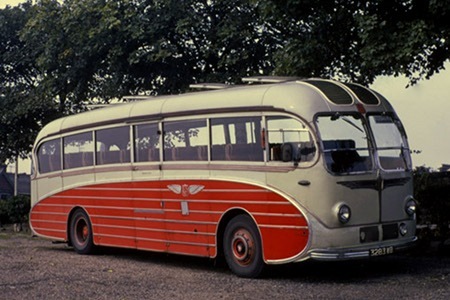 Superb coaches, and the last in the line of Panoramas before the era of the Panorama Elite. The new era would also herald the arrival of 12m coaches but also the reappearance of medium weight 6MU3R (AH505)coaches for duties where a 40’00" long heavyweight would be just too much. In connection with the article about ‘Burlingham’s flock of Seagulls’ by Neville Mercer. I would like to contribute the above shots of my all-time favourite coach. They looked great and were a real joy to ride. SUT’s Seagulls took me on holiday to Skegness. I attach two views, nearside & offside of the 1957 batch. Not sure of the location of 269 but YWA 273 is seen loading in Pond Street, Sheffield. Additionally many had names of European places on SUTs trips, for example, 269 was Como and 273 was Interlaken. Both had worthwhile careers after SUT. The Seagull and SUT livery were made for each other. Photos purchased from RHG Simpson. SUT coaches differed within batches as to capacity (from 30 to 41) and in the case of the Burlinghams as to seat style. Some, the "Oyster" seats were standard high backed coach seats, but others (on touring coaches) had retractable heads for better vision. Later 36′ Plaxtons had only 44 widely spaced seats for touring and no headrests for similar reasons. I reckon these particular coaches were a comparative rarity. From the Seagull Mk. IV onwards most examples were front entranced with a subtly slightly more squared up front end to suit. It seems that on the few occasions when a centre-entrance was still specified the original more rounded profile of the classic Mk. I to III was retained. This is presumably a Mk. V because of the curved rear corner window arrangement. As recent discussion has pointed out, Plaxton also retained a more rounded front end on their centre-entrance models of the period, and even more so Duple on their later Brittanias. 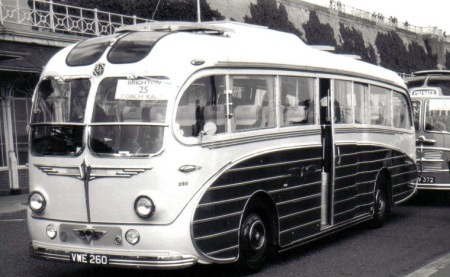 In response to David Oldfield’s interesting observation on the similarity of the Seagull to the Duple Vega body of the era I submit a picture of TWJ 249 which was one of a batch (243-252) of C41C Duple Elizabethan bodied Reliances delivered to SUT in 1955. They were MU3RV The first of the Seagulls followed in 1956. Whilst the Elizabethan is not un-attractive, for me it does not please the eye so much as either the Seagull or the Duple Vega. 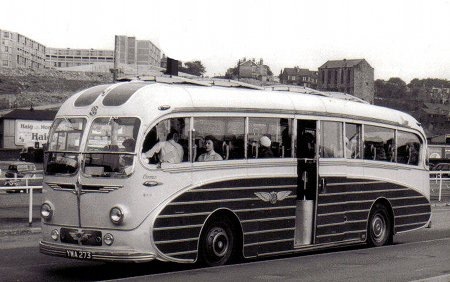 The earlier batch of Seagulls for Sheffield United Tours is represented here by VWE 260 delivered in 1956. The batch was 255-266 and they were AEC Reliance MU3RV (780-791). The Seagull bodies were C41C (255/6), C39C (257/8), C37C (259-264) and C30C (265/6). The third, and final batch of AEC Reliance Burlingham Seagulls delivered to Sheffield United Tours is represented in this picture which, as before, was purchased from RHG Simpson and illustrates 3283 WB. These were again MU3RV (1529-34) and C41C. All of these went to Neath & Cardiff, and became "Brown Bombers" in 1966. Fantastic collection, Les. Thank you for that. In the background there is one of only two vehicles "bought" second-hand – as opposed to coming with the acquisition of a fleet. 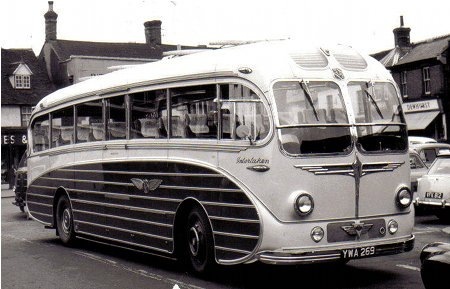 Two AEC Regal IV/Plaxton Venture II came from Altrincham Coachways in 1954 when less than twelve months old. 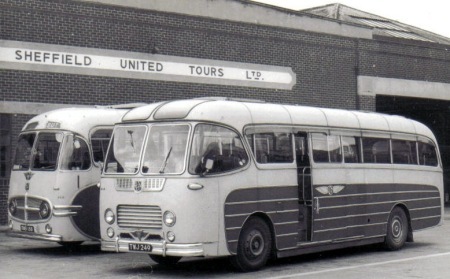 Altrincham Coachways was a subsidiary of North Western Road Car – one third of the consortium that owned SUT (along with Yorkshire Traction and East Midland). "Bought" may, therefore be stretching it a bit. One was involved in an accident but the integrity of the body held up and impressed SUT engineers so much that it was responsible for them going to Plaxtons for the Panorama when Burlingham, their preferred builder, was unwilling to do so. SUT worked very closely with Plaxton on the design of the Panorama and I believe they had the first production model David. Also, the first 36′ coach on UK roads was SUT 326, 136AWJ, which was a Reliance4U3RA I think. This was Plaxton Panorama C44F where the forerunners had been variously C36/40/41F. Many of the original ones had names which were prefixed Panorama. For example the first two,285 and 286, were Panorama Pilot and Panorama Pioneer respectively. SUT didn’t have any Roe Dalesman however Sheffield Corporation had one, 9000WB fleet number 900/90 which had a central doorway but was mostly used as a "committee" plaything I think. Here I am! As far as I know there is no record of Burlingham purchasing parts or design rights for the "rear end" arrangement on the Seagull Mk V from Duple. Almost all external panels were made from sheet metal in Burlingham’s own workshops. 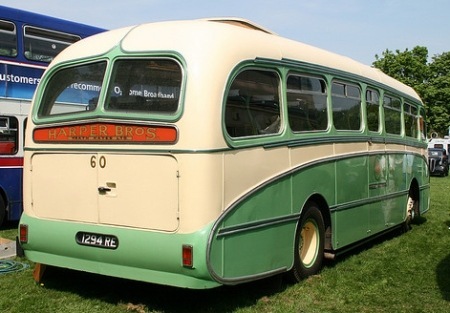 Since the Seagull V was introduced two years after the first model of Duple Super Vega with a similar back-end one must suspect that a Burlingham designer was a fan of Hendon’s design. This kind of plagiarism (or is it "imitation is the sincerest form of flattery"?) was quite common back in the 1950s with both Trans-United of Rochdale and Heaver of Durrington being well-known for their Burlingham clone designs. Heaver finally took it a step too far with their New Look design of 1952. This was around 90% Seagull and attracted letters from Burlingham’s solicitors. The model was rapidly discontinued. Hate to correct you, David, but North Western didn’t buy Altrincham Coachways until 1958. 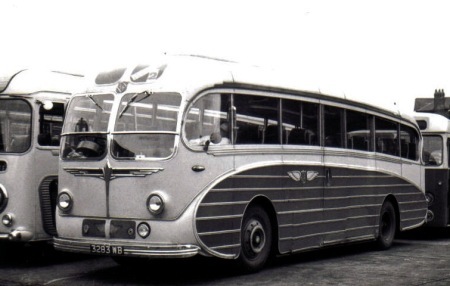 At the time it sold the coaches to SUT it was still owned by the Frank Ford organisation. Ford was in the habit of selling off relatively new coaches if the price was right, and then replacing them with older vehicles from elsewhere in his empire – Altrincham Coachways received hand-me-downs from Triumph of Hastings and Gardiner of Spennymoor to replace the majority of its own fleet in 1956-57. Then, after stripping the firm’s assets, he sold it to NWRCC. That Duple Elizabethan has a front dash panel and grill the like of which I have never seen anywhere, never mind on a Duple Elizabethan, and it is not an improvement! In its natural form I think the Elizabethan was neater and more elegant than the Dalesman, with more continuity of level between the front bit and the main window line. I’ve never heard mention of any connection before – it just looks like mild plagiarism to me. 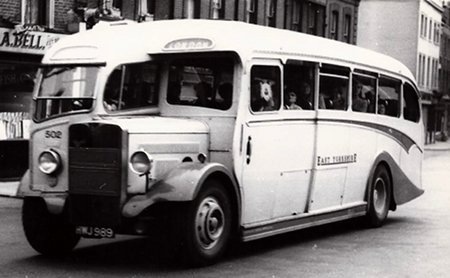 According to BBF17, Altrincham Coachways did not become a North Western subsidiary until 1958, so a purchase in 1954 would have been exactly that. I thought you maybe interested in a colour shot of 3283 WB. The naming of SUT coaches started with Ben Goodfellow calling the Windover Regal IVs the "Gay" class, after his daughter Gaynor. [Another North Western connection. NWRCC had taken over the Goodfellow business and Ben moved over to be General Manager of SUT.] I believe the Elizabethans became the Elizabethen class (hoe original) and the Burlinghams were the Continental class. Yes David, it’s the same Frank Ford, and I completely agree with your comments about his later career. For some reason he always reminded me of Freddie Laker, but I’d probably better not use the word "spiv"! Aw, go on. There’s a picture somewhere of him giving a prize to Flight’s for their Bristol RELH6L/Plaxton at the coach rally. He just looks as you said. Some very interesting information there from Neville Mercer. 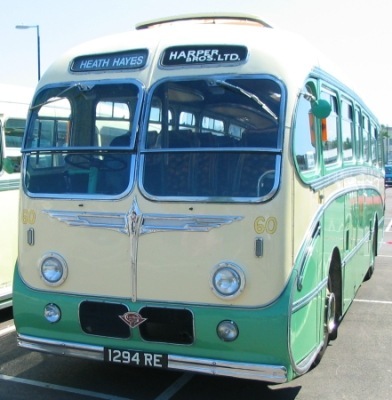 The Huddersfield Passenger Transport Group site contains a section on Bus Adverts which has a picture of the Heaver design, to which I think Neville refers. It is registered PYA 578 and bears the name ‘Crown Tours’. I had wondered if it was a vehicle which ever existed or if it was simply a ‘doctored’ Burlingham photograph, such is the resemblance. I wonder if anyone has a picture of it which could be posted on here because, as Neville says, it is 90% Burlingham Seagull! But a cheap imitation nonetheless – none of the subtlety of the original. Well, David, they do say that imitation is the sincerest form of flattery. However, imitations are seldom as good as the original, and having seen the picture I don’t think this is any exception. 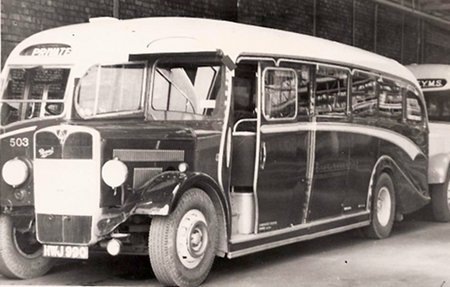 Regarding the two Regal IV’s purchased by SUT from Altrincham Coachways in February 1954 (RMB 158 & JBU 164). Both entered service with SUT still in the blue & cream of their previous owner but after around six months, the blue was repainted red leaving the rest cream. It was due to RMB 158 having a smash near the Cat & Fiddle on the way to Macclesfield that the company decided to approach Plaxtons with a view to building what was to become the Panorama. Burlingham was initially contacted by the company in 1957 but they turned down the idea. The Panorama was designed by the GM of SUT, Ben Goodfellow and his Chief Engineer, Ron Burgin. The Panorama name was submitted by an employee electrician at SUT by the name of John Otter who won £5 for his idea. Incidentally, SUT paid the sum of £3.980 each for RMB & JBU. Good to welcome Mr Weckert to the forum. I have a copy of his excellent SUT book in the Venture/Prestige series. Many thanks for your kind words David. It has been mentioned that some although not all of SUT’s Seagull’s had air conditioning. To clarify this, the first delivered in 1956 (VWE255-258) had no such fitment whilst VWE 259-266 had Key Leather units fitted in a ‘pod’ on the roof which was powered by paraffin. The 1957 batch (YWA 267-278)and the 1958 ones (3279 WB-3284 WB had Webasto units mounted beneath the floor. 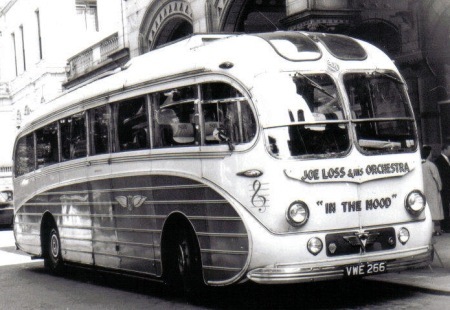 Incidentally, 266 became the official transport of the Joe Loss Orchestra and bore the legend "In The Mood" whilst SUT had this contract. This was the second coach to undertake this duty, the first being a Windover Kingsway bodied Regal IV (RWE 228). Hope this is of some interest. This one was MU3RV 791, Burlingham 6086, normally C41C, but C30C whilst on this contract. I seem to have missed some of the later comments on this thread. I like the reference to the Joe Loss coach, and its clef symbol. One of my former colleagues was something of a musician in his spare time, being involved with a Bavarian-style band. His initials were PJG, which he always wrote as the clef. Interesting to read about SUT. I regularly travelled with them as a youngster. However they used to have a coach based on the Isle Of Man. Such was the size of their operation. I remember seeing it on Douglas promenade in the early sixties. I can’t remember what model it was but I believe it was an AEC. It also had an IOM registration. Slightly off topic, but related to registration plates. When I was at secondary school in Harrogate in the late ‘sixties, our brilliant art teacher Miss Daly had a beautiful ‘Old English White’ Morgan sports car. It had the customary black pressed alloy number plates with aluminium-coloured letters/numerals, which were noteworthy in having yellow-coloured surrounds front and rear. I later discovered this indicated that the vehicle was temporarily imported from abroad, which tied in nicely with our art teacher being from New Zealand. (From memory the car was registered in the HOX-E series). Probably a long shot, but I wonder if any PSV’s ever sported such plates. Thanks for the info regarding the Q-series registrations Roger. Although I knew of them, probably from I-Spy books, I had obviously misunderstood the information I had read in my youth relating to yellow number plate surrounds, and wrongly linked the two. All these years I have been under the mis-apprehension that the white Morgan was a temporary import. Following further research on t’interweb, it transpires that between 1963 and 1972, vehicles purchased in the UK for subsequent export were given number plates with yellow edging (which was changed to red in 1973), indicating that purchase tax (or later, VAT) had not been paid. Fortunately this still ties in nicely with said Morgan, as Miss Daly left the school in 1968, presumably to return to New Zealand with her fine sports car. I hold my wrist out for a firm slap Roger, comforted by the fact that this website continues to contribute so admirably to lifelong learning. Although the Kingsways of SUT were the first ‘official’ named coaches in the fleet, a number of unofficial namings took place. Half cab Regals from the KWA batch received the following KWA 707 Yorkshire Lad, KWA 712 Highland Monarch, KWA 717 Torquay Queen, KWA 721 Bournemouth Belle. 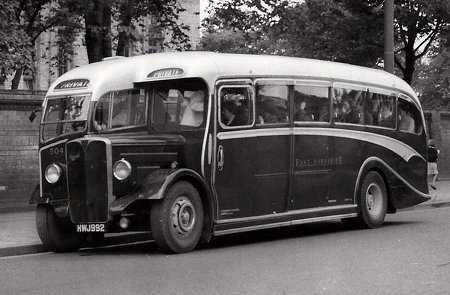 KWA 723 was the first Sheffield Wednesday coach in the fleet. Originally it had a football mounted above the cab. A number of Kingsways had Thermotank forced air systems from new. Incidentally some of the VWE regd Seagull had air conditioning by Key-Leather mounted in a pod on the roof powered by Paraffin. What did I start here?? What a great post this turned out to be, with some wonderful comments and information from a wide range of knowledgeable people. Thanks Trev for this latest comment which confirmed to me that I was a tad less mad than I thought I was. I always thought that I had either seen, or seen a picture of, KWA 712 as "The Yorkshire Lad" when I was just that. I have never been able to find any such confirmation in print. I, for one, am never too old to learn something new and today’s lesson came courtesy of Mr. Weckert! Hi Les, Just to put things straight, it was KWA 707 that wore Yorkshire Lad and it also bore a Tam O Shanta transfer on the bonnet side. 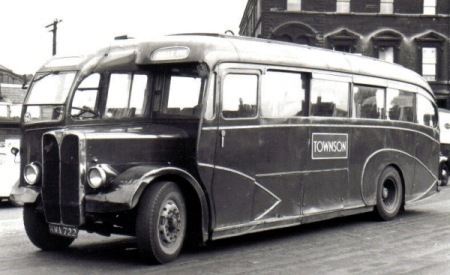 In the early fifties a number of coaches were borrowed from Northern Roadways in Glasgow and upon return by SUT staff (including Jack Hancock and Jim Heenan) it was noted that their coaches had this transfer on them. The management was asked if they could spare a couple. Upon return to Sheffield, transfers were affixed to bonnets of KWA 706/707. I have your book from the Library at present. As a boy I used to go & look at the SUT garage to marvel at the coaches & their destinations. You did a great job Trev. Regarding the 1st Montreaux Coach Rally. I was always told that my Father Walter Fothergill was the driver who drove the SUT coach that won this rally.